Heat a pot over medium heat. Add the amaranth to the pot and toast until fragrant/golden; 1 to 2 minutes. Add water, coconut milk, and salt to the pot. Bring the mixture to a boil, and reduce to a simmer, cover and let simmer for 20 minutes. Remove from heat and let sit for 5 to 10 more minutes to thicken amaranth. 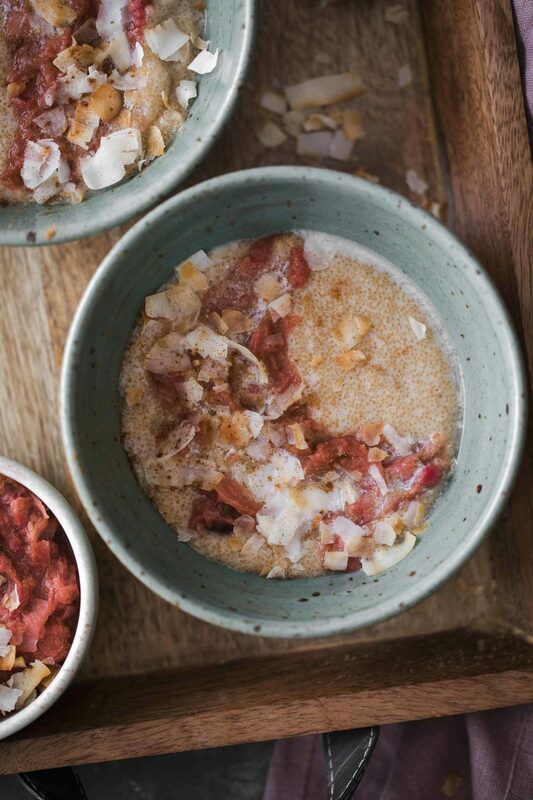 In a separate pot, combine the ingredients for the rhubarb topping. Heat over medium low until rhubarb is cooked and has broken down. Taste and add extra sweetener or cinnamon as desired. Divide the amaranth into two bowls and stir in the rhubarb mixture. Sprinkle with toasted coconut and a drizzle of coconut milk, if desired. Tips + Tricks: To toast coconut, simply place it in a skillet over medium low heat and stir often until lightly brown and aromatic. 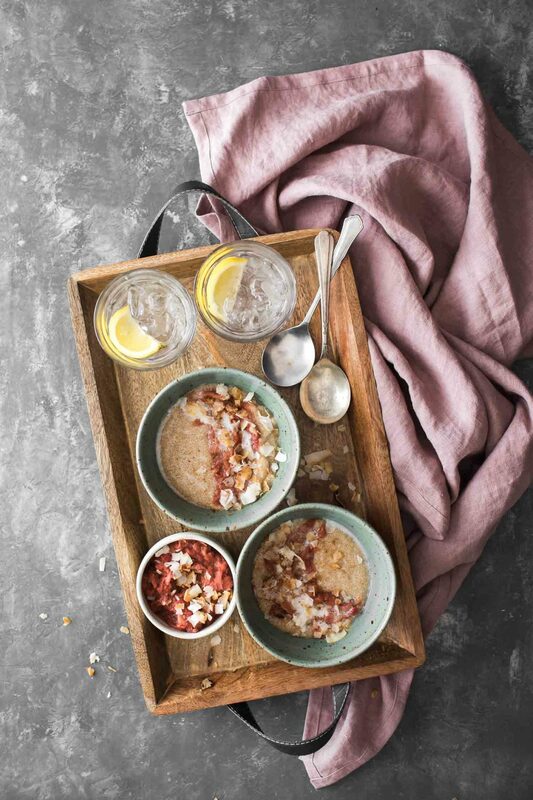 Given this is a pretty solid grain porridge, there are many ways you can swap things around given your desired tastes and what you might already have on hand. 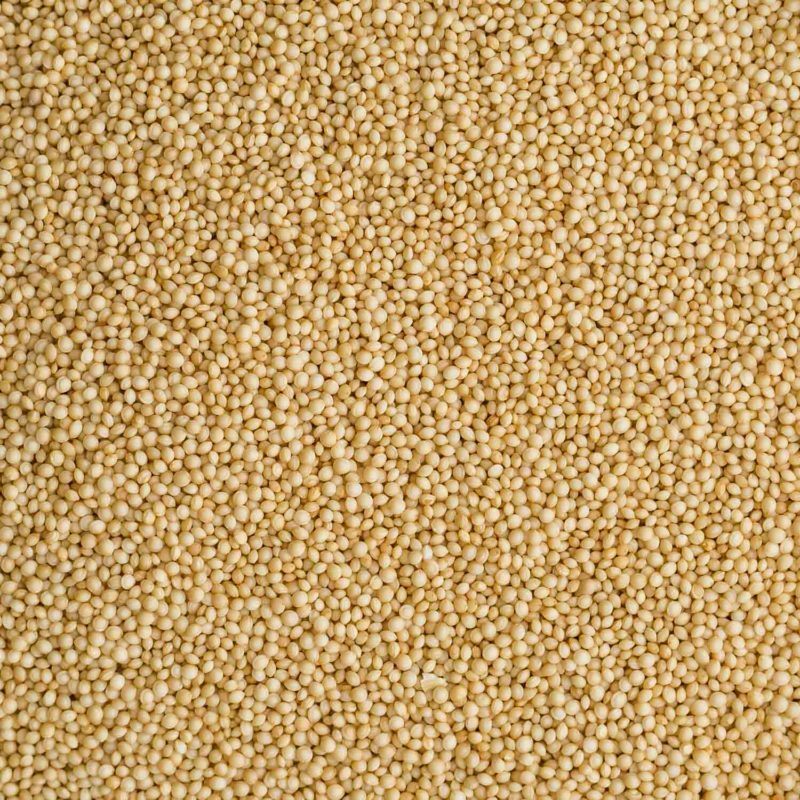 Grains: Millet, buckwheat and quinoa also work well in place (or with) the amaranth. Strawberries: The rhubarb is really quite tart and it can be hard to balance the tartness with not going overboard on sweetener. Try adding equal amounts of strawberries to help. No Coconut: I don’t always have coconut on hand but most of the time have cream (or a nut-cream). Feel free to use those in place of the coconut milk. Such a lovely looking breakfast! Yum! The weather has definitely taken a turn for the worse here and this looks like the perfect comforting breakfast for a grey morning. Well hello fellow musician 🙂 Thanks for stopping by! Perfect looking breakfast. Coconut + rhubarb is a fun, unique flavour combination. Cannot wait to try it! 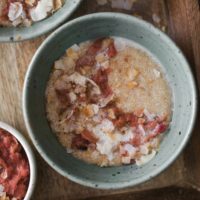 Came across this via an aggregation on thekitchn – subscribed now, this recipe looks incredible, though I’ve no idea what amaranth is. Hopefully I can just ask someone at the store! You can usually find it in your local health foods store. Hope that helps! Hi Erin! First of all, I love your website and your passion for organic, wholesome and alternative foods and ways of cooking. Anyway, I have a question for you: Having been a Coeliac for many years now, I decided to give amaranth another go (as two years ago, I had a cooking disaster with this little grain).